Longtime husband and wife Benjamin Fingland and Jessica Meyer join forces with pianist Amanda Harberg to present an evening of pieces by composers from Long Island and New Jersey. “Joisey” composers include compelling works by John Kaefer, Roger Stubblefield, Robert Aldridge, and Piaclava’s own Amanda Harberg. Though not exactly a “Lawn-guylander”, one still needs to cross a bridge or tunnel to get to George Gershwin’s birthplace in Brooklyn. The show opens with a new trio by Billy-Joel-lovin’-Long-Islander Jessica Meyer. 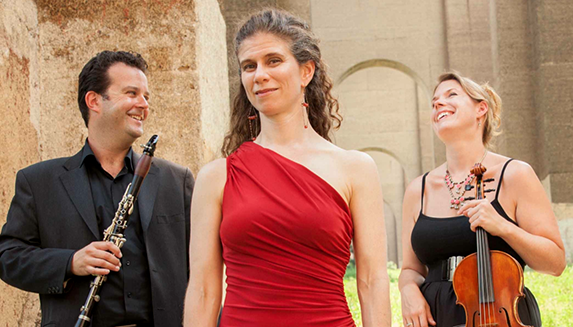 Piaclava is a clarinet, viola, and piano trio dedicated to performing engaging music of the past and present – including works by the musicians themselves. With its unique instrumentation and virtuosic flair, they explore not only the standard repertoire written for this trio, but also a variety of solo and duo works from classical, popular, modern and world-music repertoires, allowing them to draw from a unique array of sounds and styles for each concert. Since 1994, husband and wife Benjamin Fingland and Jessica Meyer have been collaborating with several pianists to introduce a diverse and emotionally powerful repertoire to audiences of all kinds. As of 2015, celebrated composer/pianist Amanda Harberg is adding her own unique voice the ensemble. Venues have included the Weill Recital Hall at Carnegie Hall, the MET Balcony Bar Series, and a highly-acclaimed three-week tour of over 20 public schools in the New York City area for the Lincoln Center Education. For years, they were in residence at PS 153Q as part of Little Orchestra Society’s “Musical Connections: The School Partnership Program”, which inspired members of Piaclava to create their own version called “Tunes and Tales.” Currently, they tour universities and offer workshops on composition, building a career in music, engaging audiences of all kinds, and the art of partnership between composers and performers.